Healing, therapy, and art belong together. That combination rarely results in a documentary of interest to anyone outside of the artist/patient’s circle of friends. Not so in the case of Mark Hogancamp and his non-ironic photography of dolls. Years ago, Mark Hogancamp was beaten senseless by five youths. He lost his memory, his motor skills, and amazingly, his alcoholism. He also lost much of his life. “After the attack,” defines the time of Mark’s life where he lives now. It’s as though he were born again. He used to draw and write in journals, but his hands no longer work like they used to. When the money ran out for physical therapy, he continued his own therapy by working with scale-model dolls, buildings, and vehicles. Instead of drawing, he stages and photographs scenes that tell stories set in the fictional town of Marwencol, Belgium, during World War II. Marwencol is inhabited by many Barbies and lots of male friends. It’s a little pocket of peace. In Marwencol, the Germans, Brits, and Americans all get along and drink at the bar (it’s one of the rules of the town). The entertainment of choice is watching women cat-fight. Mark’s alter-ego doll never drinks alcohol, only coffee. 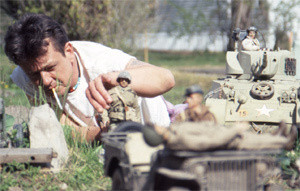 Mark has an ongoing storyline set in Marwencol involving himself and the alter-egos of other people in his life. As the story unfolds, he photographs the scenes from the perspective of the dolls. The shallow-focus photography and Mark’s sense of forced perspective create some surprisingly lifelike photographs. That his imagination extends beyond tea parties and “house,” lends a serious note to the proceedings. The Marwencol soap opera is also therapy for Mark, so he stages scenes where people are attacked at random. Mark expresses his anger through images of war where the attackers, usually Nazi SS men, are gunned down by American snipers. The SS in turn are motivated not by racial superiority but their pent-up desire to get drunk. It’s an adult world where men and women make love, have relationships, get married, and sometimes die. The movie takes us beyond Mark’s life when an art magazine runs a spread on Marwencol. After that success, Mark is invited to exhibit his work in New York. It’s an offer he can’t refuse, but Mark is anxious in public places, and the idea of traveling to the city and being the center of attention scares him. Marwencol is shot on video, of course. In a less engrossing movie that might be more of a detriment. Mark’s story, his frankness, and his surprising and moving photos make the production quality almost moot. The pacing is good, too, with new revelations coming at the hour mark, a little later, and again at the end. These deepen Mark’s unease at going to New York, and make his story more challenging for mainstream audiences. The movie handles it all gently and honestly. I wouldn’t call Mark a brilliant artist — I don’t want to oversell his work. But like the work or not, the documentary tells an amazing story of a fragile, healing man. We don’t find out everything about Mark — how or when his divorce came about, what his bad days look like. But Mark is a brave man for letting us in to his “little” world, and into his recovering mind.